I like the figure of this piece of Maple! The usual through dovetails, Brusso lid support, keyed lock, continuous hinge, and red velvet lining. Beautiful wood and a great looking result. Nice choice of hardware as well. 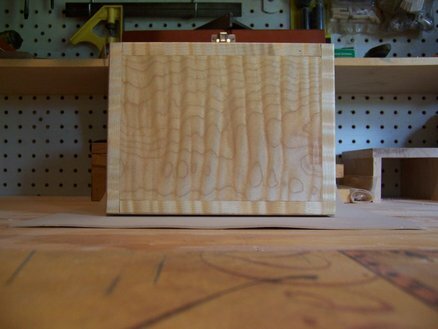 Nice box and dovetailing, curly maple always looks great, such a pretty wood…great job and thanks for sharing. Nice box! What technique did you use on that velvet lining? It looks sharp. how did you apply the red velvet? Curley maple is one of my favorite woods. You did it justice with this box. Nice work! Very nice box. Came out just great. Oh Roger, I’ve never heard that one before. (LoL) Daniel, I made some “interior” tools out of scrap hardwood, and I use them to tuck the velvet into the corners. I find that metal tools can damage the velvet. I like nice sharp edges on the inside, it just looks better to me. The velvet itself is from Rockler, it’s self adhesive so one must be very careful. It can stretch out of shape very easily, and wrinkling can be an issue also. Patience, patience, patience…and a little hair pulling will insure great results. Thanks for the kind words, and the warm welcome. I’m proud to be able to interact with some of the finest woodworkers I’ve ever seen.